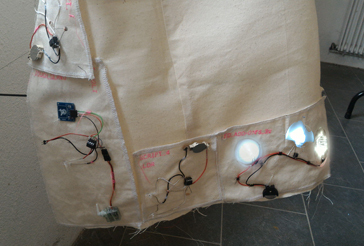 The second subject during this week for me was using sensor patches (small pieces of fabric with electronic circuitry) on a wear thing. The wear thing was made with patterns of Sascha on canvas fabric. The patches are on the same canvas. First the patches were added like the first version, trying to cover the whole garment. In the first example this worked out natural “as a skin”. The skin having lot’s of sensoring cells everywhere. But with this garment made at Paillard this covering principle didn’t make sense. In the second try the patches were put only on the fringe of this wear thing. This makes the patches in a kind of decoration on the border. It is the start of an idea. For the fringe more compact patches are needed – besides making some sense of their functioning. This sketch is guiding the design principle and giving sense to the functionality of the patches.